PALO ALTO, Calif. -- Uber Technologies Inc. is pulling a heavily criticized feature from its app that allowed it to track riders for up to five minutes after a trip, its security chief told Reuters, as the ride-services company tries to fix its poor reputation for customer privacy. The change, which restores users' ability to share location data only while using the app, is expected to be announced on Tuesday and rolled out to Apple Inc. iPhone users starting this week. It comes as Uber tries to recover from a series of crises culminating in the ouster of CEO Travis Kalanick and other top executives. Dara Khosrowshahi, the CEO of travel-booking company Expedia Inc. is set to become Uber's new chief executive, sources have told Reuters. 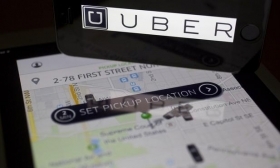 The change comes two weeks after Uber settled a Federal Trade Commission complaint that the company failed to protect the personal information of drivers and passengers and was deceptive about its efforts to prevent snooping by its employees.